I logged into my Citibank credit card website which I believe has recently undergone a redesign. I wanted to double check that I have direct debit set up to pay my credit card bill. This was because on my credit card statement, nothing indicated to me that I had set up direct debit. After looking through the site, there was nothing to indicate whether or not direct debit was set up. I was also looking for the option to pay off my bill online on the website. If I wanted to pay off my credit card online, there was no way to do this either. In the MAKE A PAYMENT option under the current and available balance, the only options were to pay OTHER bills with the credit card, not pay the credit card off. In the end I called up the call centre and asked whether my account was set up for direct debit. They confirmed that it was and that I should be able to see that on the website. After telling them that I couldn't see it and asked her how I can get to that screen, I was put on hold and she came back to say that it's not possible to see it online. I forgot to ask about online payment of your credit card but when I checked the credit card statement again, this is what I saw. 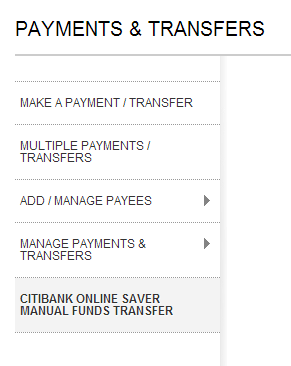 So if you have a Citibank deposit account, you can pay online. If you don't you will need to call up to pay over the phone. With a 20.99% interest rate, I can understand why they would want to make it difficult for you to pay off your credit card each month. Interesting times..